I have a wide and high volume forefoot with a narrow and low volume heel, and have struggled with shoes over the last few years. I didn't realise how well a shoe could fit until i tried the Testarossas. The width of the last combined with the laces allow my foot to fit the relatively pointed and locally down turned toe perfectly; no unnecessarily crushed toes and no dead space under the middle of my forefoot. The laces combined with the generally high volume fit allow by foot to better conform to the overall downturn of the shoe too. I downsized 2 Euro sizes from my street shoe, and found the fit to be extremely comfortable. I think i could have gone down 3 euro sizes and the should would remain comfortable one they stretched a bit but perform at a higher level. The shoe is far too soft to have anything bigger than 2 sizes down; especially considering its width and volume. 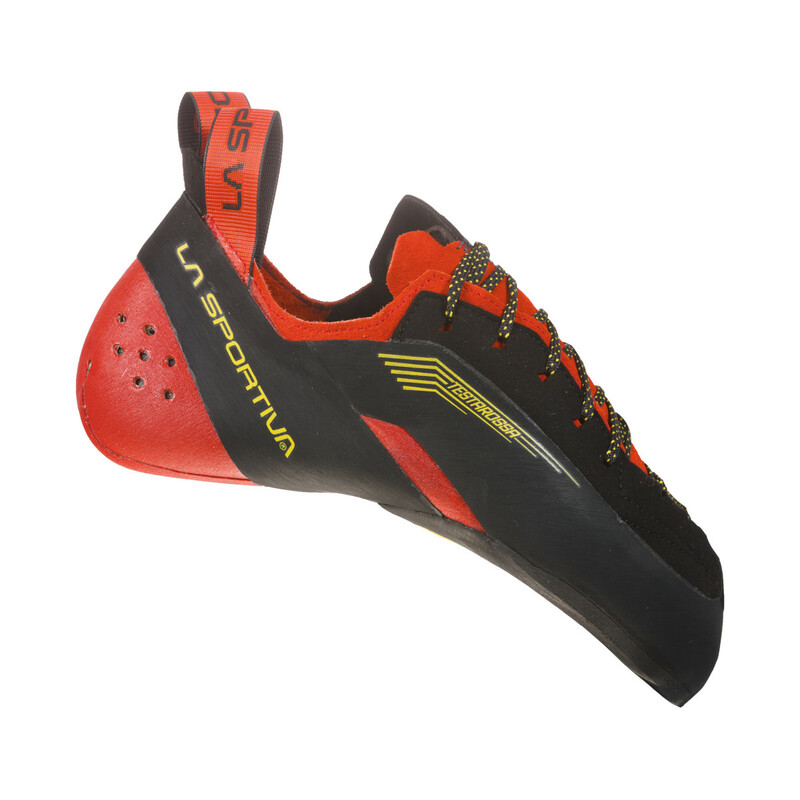 Don’t worry about the quality of La Sportiva products, they're top notch. Focus on the fit, features and performance. For me the lacing plus going up a half size accommodates my high-volume foot—high arches, and wide forefoot—w/o loosing any performance (the heal is still a bit loose). This is a soft shoe, w/o a lot of support. So, it’s not great for full on cracks but it’s brilliant for edging and smearing. I've used them for both sport and trad. They absolutely shine on edgy sport routes (the grip is amazing), not so much on long, multi-pitch trad routes. As a go-for-it shoe where precise footwork is needed, these are the ticket. This is my second pair of Testarossa, It's really good for wide foot like me. My size is 36.5. I've bought the scarpa vapor v for 36.5 and can't even squeeze my foot into it (the length are the same but the width is too narrow). Testarossa is very flexible and the shoe would shape into your foot shape. My normal size of shoe is 36.5-37, and I bought the size 36.5. It's tightly fit which is what I wish to do some harder routes. Highly recommended!! Despite the aggressive appearance the Testarossa has been for me the most comfortable technical climbing shoe for steep ground. The toes are sharp enough for edging and for small placements but the rubber soft enough and shoe flexi enough for smearing. The heel is a confidence boosting snug fit. 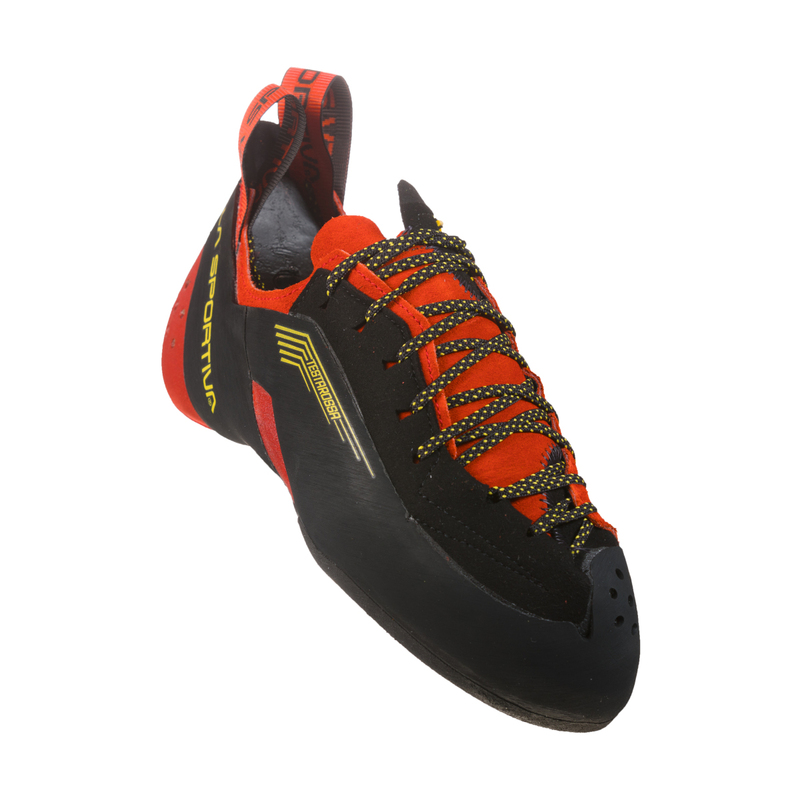 After many years of trying new products trying to find the perfect shoe for sport climbing I can now say that I have. This is now my fourth pair and I can't recommend them highly enough, obviously only if the shoe fits Cinders. Great product, amazing price on this site with an unbelievably quick delivery and great customer service. Overall a very good shoe. I have been wearing them for about a month, mostly indoor on a mix of vertical lead and bouldering. The sole sticks a lot and even if it is showing an aggressive down turn it does a good job while smearing. The heel is pretty soft and loses shape while hell hocking, it does not give much confidence however the rubber on the heel is good as well and sticks. On top of that the shoe stays snag and never feels is about to pop. My large feet feels comfortable and the laces system allows for a good adjustment, especially because they are running close to the front. The first 3 loops run with only one side of the the lace where the other goes straight vertical the external link. I thought at the beginning it was mostly a style choice however I found myself adjusting the tension on the vertical link and makes a good difference on the positioning of my 3rd toe. It toke more than other shoes to find the correct setting, which I think it is only in part due to the leather adjusting because sometimes I would feel big changes from one route to another while messing with the laces. Also as the laces go so deep into the front I don’t feel very comfortable to climb without lacing up as I always used to do with my Boreal Lynx 2014 (best quality/price shoes ever had). Worth noting that I have a large foot and the laces are quite tight in the front, so they may not be the best choice for narrow feet. Quite a firm edge, feels comfortable to step on it, even on the external side. Needless to say that you will find yourself going with the toe anyway in some situations just because they are fantastic at that. The helper loops on the back are a bit too small for my liking, my fingers get stuck on them to the point that I have to sit to wear my shoe to avoid comical falls. Even the carabiner I use to transport them outside my bag is a pain to remove. 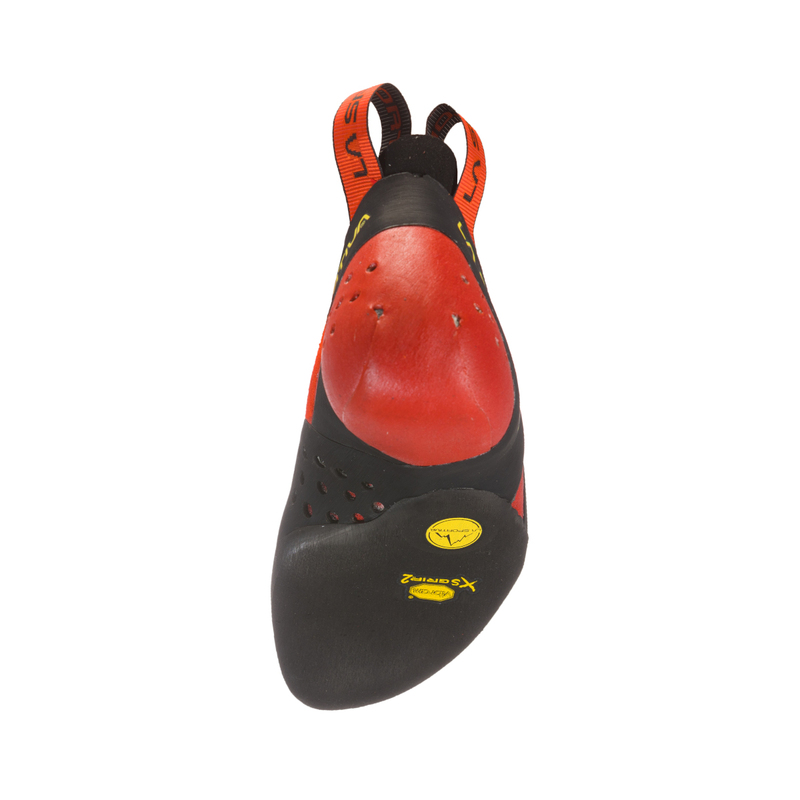 A very versatile climbing shoe! 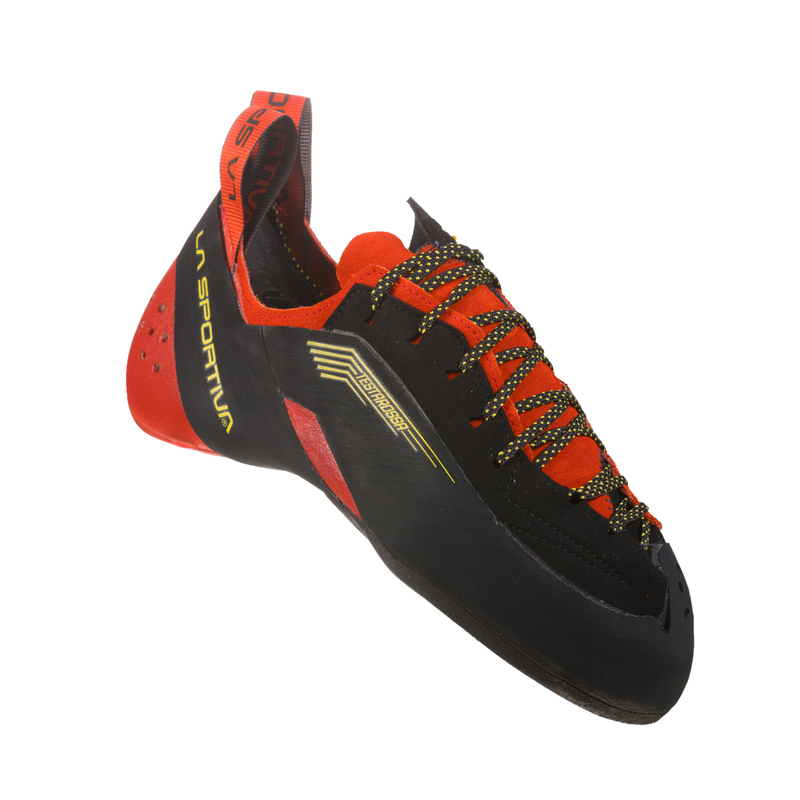 I bought Testarossas after having Solutions for the last couple of years - it's always difficult to try a new type of climbing shoe and I was a bit hesitant! However, after using these outside (not even worn in), would not go back to Solutions! They are soft, so there is good sensitivity and you can smear really well; this combines with a very good edge on them. I felt like my feet would stick to anything. The heel is good, although I don't think my heel fits in the shoe perfectly. Overall, they are easy to trust and easy to climb in. I suppose the only negative is that you have to lace them up all the time but it's worth it! Performance, great fit and sensitivity in one pair of shoes! I have climbed on a number of different shoes, like the La Sportiva Miura and Miura VS, La Sportiva Solution, Five Ten Anasazi, Evolve, etc. But since I've switched to these shoes, I'm hooked! These are in my opinion some of the best shoes on the market. They have a great asymmetrical fit and you can fit them exactly around your feet through the laces. The soft/thin material actually hugs your feet instead of hurting them, but ofcourse the fit is nonetheless tight. Right out of the box within minutes they feel like a pare of worn in shoes! 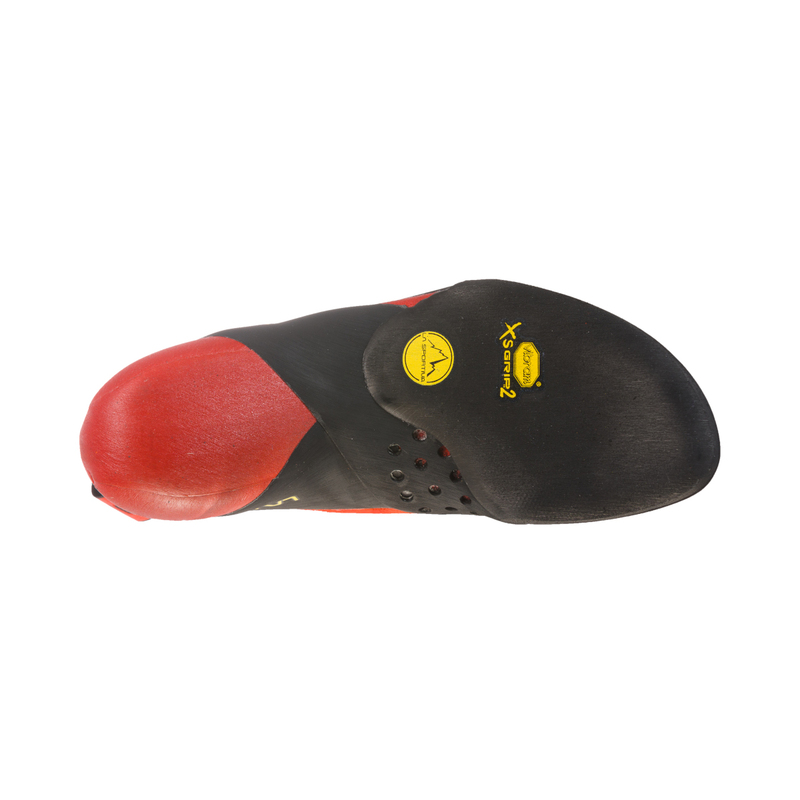 The toe-down is really agressive, and this helps a lot on, for example, technical climbs, seveire overhangs or with bouldering. But what makes the shoe really special is the amount of feeling you have in the toebox and heel, this is absolutely amazing! You can feel exactly where you put your feet and how much pressure is needed, you hardly ever will slip away with these shoes. The rubber is really sticky, so they perform well on practically every surface and you can transfer a lot of power to the tip of the shoe! For me the only downpoint is that the shoe doesn't have a big rubber surface on the toes, which makes toe-hooks a bit more difficult. And depending on you shape of foot/heel, it can in some cases be a bit strenuous on the achillisheel. I can definately recommend these shoes for anyone who is looking for great fitting technical climbingshoes with a lot of sensitivity. This is my favourite climbing shoes. I like them as you can be precise on the edges with optimal feeling. They work well on steep ground too: heel hooking is quite precise. The sole rubber is excellent: it really grips everywhere, soapy footholds too!. I recommend to opt for at least two EU sizes less than your normal shoes as they really adapt to your feet very quickly: I have friends that bought 3-4 sizes less. The only cons is that the production volume of this product seems reduced since a couple of years ago, so it is not so easy to go to shop and to get them with the right number. 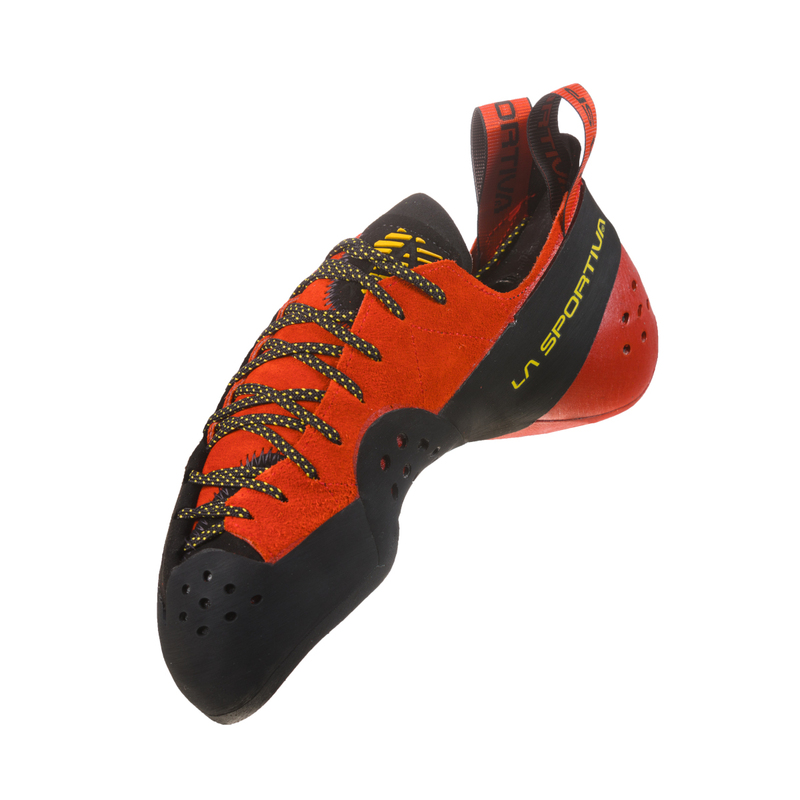 Fantastic shoe for both lead/top rope climbing and bouldering. Very comfortable and great edge hold. I was worried it would be difficult to smear with but I haven't found this to be a problem at all. I normally wear shoe size 43 1/2 to 44 and got this in size 42 1/2. 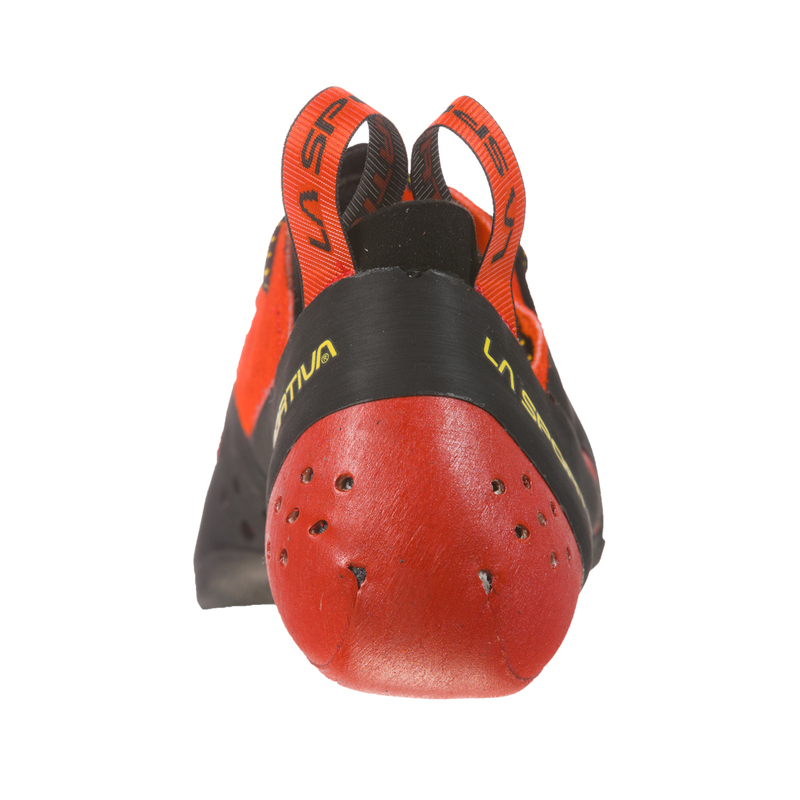 The fit was quite uncomfortable in the beginning but the shoe and especially the toe box will shape itself to fit your feet and now (a few weeks and maybe 15 climbing sessions) it is comfortable enough to wear for longer periods of time. 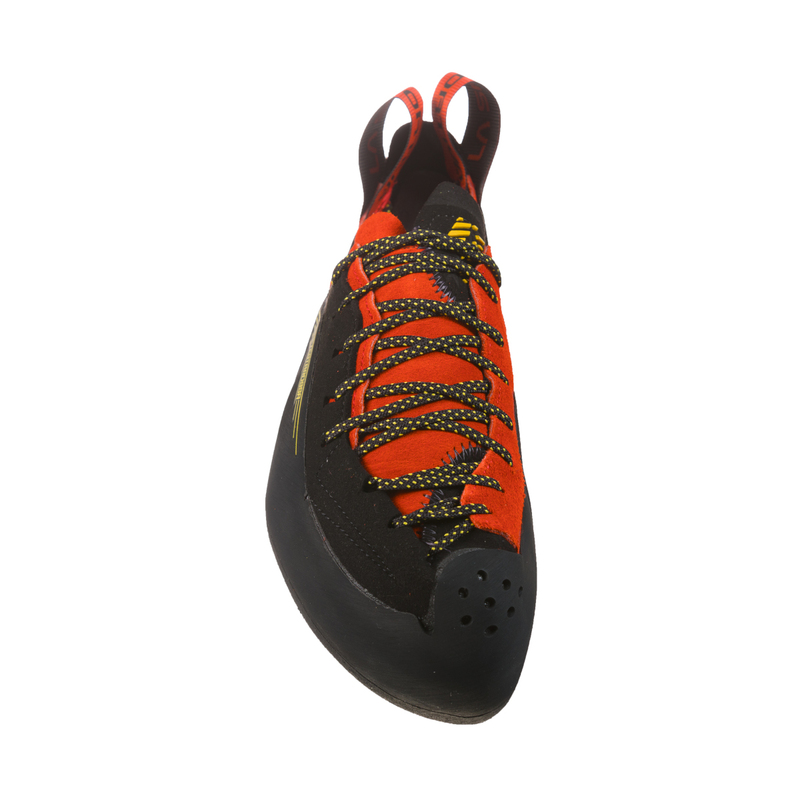 The testarossas are the first pair of la sportiva climbing shoes i purchased. My street shoe number is 42 and i used to wear 41 for climbing. This time i downsized to 40 and although the size is smaller, these shoes feel really comfortable. My foot fit perfectly into the shoe. The rubber is sticky enough to make me want to push my self more. The testarossas are my personal all round favourite shoe. This is the second pair that I have purchased. I also regularly use katana laces and find the testarossas perform to a much higher level. In terms of sizing I have found that I size them relatively small to get a high performance fit but still wearable for longer periods (20-30 min). I wear a 45 1/2 street shoe and downsize to a 42 in the testarossas (for a similar fit I wear 42 1/2 in my katana laces). They stretch slightly, possibly a 1/2 size. They have a relatively large toe box and slim heel. The heel will not be to everyones liking as it can be painful because it is quite thin rubber. I prefer the heel in the testarossas to the katana laces. The Testarossa has an extremely downturned and asymmetrical shape that lets me both pull with my toes and power off even the smallest edges. Amazing feeling, like a glove. The upper is soft, and laces are conveniently located (gives me an extremely high level of performance), It takes the shape of the foot, but please...take smaller (-3 or -3.5 numbers). I had other performance shoes, but none like these, rubber has good grip (resin, concreate holds, rock like a mirror...), and tip has well shaped, the bead has little structure (not very hard) yesterday I try some foot hook, the feedback is good, but I think is not the best position for this shoes. The colors are perfect, very aggressive (like the shape! ), Yellow and red is a very good mix.